for the review. Somewhere in the middle I was distracted by comments about a Denver sports team - but it was a useful review nonetheless. Since I have been pushing for higher volume baking as of late, it seems a bit small to me - but I do love me a good toy. Worth thinking about. In every production line there will be a choke point that limits production. To increase production volume requires adequately sized equipment at every stage. At this point, I can mix and proof up to say, 9 pounds of dough but I can only get 4 loaf pans in the oven at one time, small oven. So that's 6 pounds. I think most normal sized ovens will handle 5 or 6 at one time on a single shelf. This device helps me at this level but I'd need two to get any larger along with a bigger oven. And there is a deep satisfaction in a tool that is well designed anddoes a thing well. But if it doesn't hold at least a half sheet pan, it would limit proofing for me as many of my things these days take more than the 9X13 pan just because of the shaping (born to braid...). But I don't know if that is enough for me to lose interest. Anyway (sigh)- one suspects I'll never really be content until I have a commercial oven/proofer/loader. Yes by all means a sheeter! My dream kitchen. what a nice new one. Thanks for this thorough review Eric! I looked at clazar123's post about this product the other day and thought it looked like a a better solution to home proofing than most of us use. Tis a bit more than I'd be willing to pay at the moment, but as you say the price is likely to drop. It's always been an issue for me being able to create the right environment for fermenting, proofing etc during our cold months here on Vancouver Island. Having read your review and knowing your attention to detail and precision I'm seriously considering getting one in the months ahead. 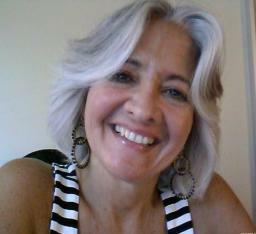 I might even forward the link to Marie as a subtle Christmas suggestion LOL! There must be a few of us out there that get the look when the old Styrofoam cooler appears on the kitchen counter and this piece of equipment might just put a stop to it once and for all. Hehe, you are a planner. I'm really enjoying using it and I'm trying to use it 3-4 times a week to see if it will hold up. It's so simple, I don't think there is much that can go wrong. I'm sure it would look great on "her" counter. I really need something like this. It's a little pricey. I wish I knew it would last. It is so simple and the heat element is such a low wattage I think it is unlikely to fail.. Your attention to detail is much appreciated, Eric. The proofer sure looks interesting. Since the cold seaason is upon us and my woodstove will soon be fired up, indoor temps aren't a concern during winter months since my house is always warm. Summer is another story (most years, that is - won't count this past summer). Love the way it folds up. That, and if it remains accurate, is a big selling point. Hope that you'll keep us updated on its consistency over the next few months. I'm really looking forward to the Lions game. I grew up in Jackson Michigan and most of my family stills lives in the State. It has been a painful wait watching the Lions get bad break after bad break. You know the NFL, anything can happen on any given day. This proofer is almost to respectable looking for a guy who used to use an old beer cooler. I think my wife is about to claim it as hers, lol. Thanks for the review. Seems like a great product. The yogurt (and buttermilk) culturing utility is a great bonus. I love making my own yogurt and buttermilk as much or more than bread baking. Not really, but it's so much simpler. Luckily, I can get it all done with a heat pad(or room temp). The price of the proofer puts it in the "luxury" item range for me, unfortunately. Those rolls look great. If you get a chance, can you share the recipe? I have to confess, I made it up (the rolls). I started with 400 grams of AP and Lilly AP which is very soft. To that I added milk at 68% and 2 teaspoons of yeast and 2% salt. I used 1 tsp of clover honey. Brushed with butter. Strictly seat of the pants. Divide into 15 small balls and let it rise. I think the proofer is one of those things that seems like a luxury until you use it a while. Then you don't know how you lived without it all those years. My IR thermometer is in that class too, lol. Now, if you can arrange a TFL group purchase at, say, 30% off retail, I'll sign up for one. You didn't mention the window! Saw it in the photos. That is clever and no heat loss peeking on the dough! I've been drying mushrooms lately. I bet my dryer racks fit inside. Eric, can you stack cooling racks inside? We have used drying/cooling racks doing similar things and I got my husband to cut some strips of wood so I could stack the racks. Sounds like a win win! Winter is coming and for a lot of us that means a cold kitchen. I too have used the oven and a pan of hot water. Then I was stuck not using the oven till I was done with the bread, or I had forgot and turned on the oven while it was in there and all my work went down the drain. I know its a lot of money, but I bet most who really want one can justify the cost. If you look out in the garage/closet or where ever I bet you can find a lot our spouses bought that we can use as examples of the same thing. If it means me being able to give my family bread more often this winter, I'm in. Eric, just a thought! My friend would hatch chick eggs in her yogurt maker..placed on towel and turned regular..I bet this would provide the moisture and temp for hatching some chicks 'lol'.. It would make an ideal egg hatchery.. there is no element risking fires to a towel. Great idea. I've hatched my own in the past. for the review. It is really cool and dry in my kitchen and this would work great! 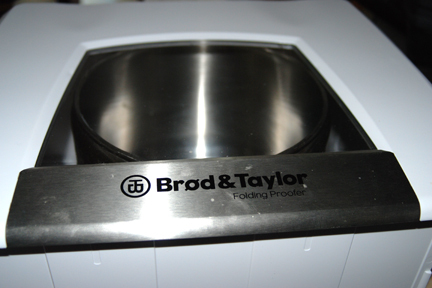 BTW, I hear the Brod & Taylor Folding Proofer will be available soon from the manufacturer. How long does it take to warm up? I'm asking because I bought one and I had it plugged in for over 1/2 an hour and it never got warm. It lights up and says it's heating. No flashing at all, I noticed you mentioned flashing of the heat light. You must have a problem with the unit unfortunately. Give Brod and Taylor a call and they will take care of you. ok thanks, I was hoping I was doing something wrong. I'll call them. 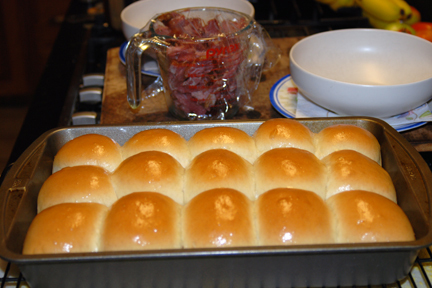 I got my new proofer and used it on Thankgiving to proof my dinner rolls, which came out great. Can't wait to use it again, just been too busy the last few days. I'm thrilled to have it for my Christmas baking. Glad you got a chance to use yours. 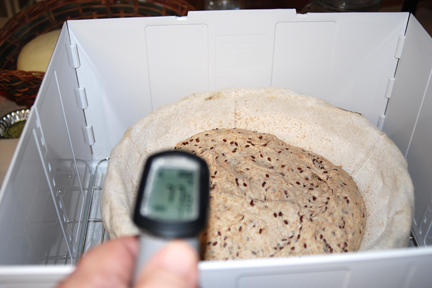 I am really enjoying the predictable results I get now I can control the ferment and proof temperatures. My previous "proofing box" was my microwave oven with a mug of heated water. 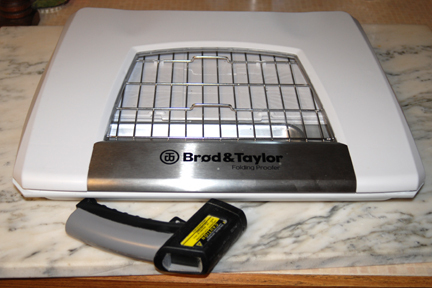 Compared to that, the Brod & Taylor box has similar capacity, but, of course, the temperature control is much more precise. There have been a few occasions when we wanted to use the microwave for thawing or heating food and for fermenting dough at the same time. It's nice to have the additional place to ferment dough on such occasions. The box easily accommodated the containers in which I do bulk fermentation. The proofing box worked very well for the Tartine bread, which I proof in brotformen. I generally ferment my San Joaquin Sourdough on baker's linen. I haven't tried this yet in the proofing box. I should be able to make the geometry work. All in all, I'm happy to have bought the proofing box. I expect I'll appreciate it even more next time I make a Detmolder 3-stage rye, where precise temperature control at each stage is more important. The ability of the box to collapse into a compact form is a real advantage. It allows me to store it in the walk-in pantry, along with my peels, proofing boards and kneading boards. It is quick to set up and take down - a very big advantage. Was in both Army and Air Force 1968-1970 so I thought I could obtain the no shipping order for my B & T proofer with validity. I ordered it on Saturday and it came on the next Friday, today. It took me 30 seconds to put it together. I'm going to proof my first sourdough white bread in it tonight and bake it tomorrow night. It is sleek, and my wife, who is a stickler for "stuff" thought this would fit nicely in numerous places. It folds nicely. I was in the Air Force my self during those years and a couple past that. Glad your wife likes your proofer as much as mine does. I have found it to be very helpful. After reading through, and going to the net to do some more reading, I decided that I've been a wonderful person (for the most part) this year. Having come to this conclusion, I also decided I deserve to give it to myself as a Christmas present. I'm so glad you enjoyed the review. Thank you for letting me know you purchased it for yourself. I have a direct line to the big guy with the sleigh and reindeer (you know who I mean) and I think he was planning on gifting you one. How nice of you to save him the trouble of carrying it all that way. Will definitely reporting back as soon as possible... Got an email this morning, it's already been shipped! Made my first bread with the proofing box! Loved it! I kept the sourdough starter inside for the final build, and then proofed the dough and the shaped loaf. What a nice piece of equipment, love the way it folds flat, and the bread rises beautifully inside. my gosh, it smelled so good as it baked ! Sally that looks Great! You should post your own thread so it will get some exposure. That's one of my favorite breads of Hamelman. two more loaves today, this time I placed the shaped loaves in two different environments: one in the proofing box, the other over the kitchen table, my regular spot to ferment loaves in the days "pre-proofing box"
Recipe is from Breadcetera site, his sourdough with double flour addition, made with a mixture of white and whole wheat flours. The dough really appreciates having a stable environment to ferment in. My loaves have a much more reliable spring with the proofer. Can I just say I love this site? Today I was looking for places to possibly take some artisan baking lessons and when I was searching I found a site that has cooking classes (though seems for everything EXCEPT baking). On this site's front page I see products they sell and right on top is the Folding proofer. "What's that?" I wonder. Me, a person who seems to find a need for almost every gadget clicked on it and was like, "Wow!" So, off to Amazon I went to read reviews. There are a lot and they are mostly favorable - though a few who say it's overpriced when you can do the same thing in the oven or microwave (which is a partial truth). I was intrigued now. Did I 'need' to have this? "But wait, " I thought. "This is probably for people who make a single loaf of bread, right?" I never, ever make a single loaf of bread. I bake 2-4 loaves at a time. I proof my doughs in the DLX mixing bowl or the KA mixing bowl. I wondered, "Would this work for me?" Well, I knew where I needed to go to find out more. And what do I find as my very first hit on my search on The Fresh Loaf? A review of this gadget by someone I trust (read several things by you before) and followed up by another person I trust (having read some of his reviews too - dmsnyder). Not only was it a great review, it was a review with the very same machines I use! Yay!!! Now... do I "need" this. Yes, I do as the temps in my kitchen are very fickle and I HATE using cloths and cling wrap on my doughs. 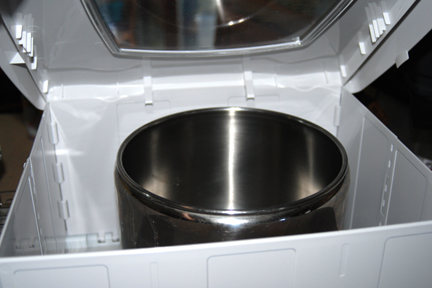 I also make yogurt and have a yogurt maker, but I'm a bit annoyed I can only make 2 quarts at a time. With this thing, I can make a full gallon (two separate containers) and be good for a few days. With 5 people in the house, 3 generations, with half of us lactose intolerant and the rest preferring yogurt anyway, we go through a LOT of yogurt and I hate having to make it every other day to keep up with the demand. I'll sell my yogurt maker and get this proofer. I also decorate cakes - great for candy melts, I bet as well as chocolate. AND it folds small. I can't wait to get it, but I probably should wait for a refurbished one to pop up to save me some $. Anyway, thank you so much for the review. This site never, ever lets me down - ever. But now to search some more or ask where to find some baking lessons! I still love it. These days I make more yogurt than bread but you are right 4 or 5 quarts work just fine and the temp control is wonderful. When I am making less than the maximum, I put the plastic containers on small saucers to temper the heat from the bottom a little. Wow, how did I ever live without this?? I ordered mine about 3 months ago. I contemplated it and this review really cemented the deal - so thank you for caring enough to share the goods with the rest of us! My only question is how did I ever manage without one of these!!????? I live in the Arizona desert where 6 months out of the year, our air conditioning is cranking away. It's most always bone dry, except when storms brew during our wild Monsoon season. 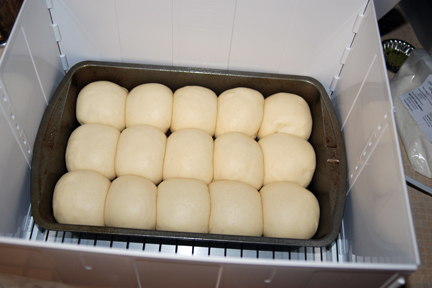 Then, the humidity and the pressure of the environment get very whacky and planning a bread bake can be difficult. I found that even through the stormy season and in spite of sitting directly under the air conditioning vent in the ceiling, this fantastic little machine performed exceptionally well. I am so in love with this.. it is now a beloved part of my baking day. If it had lips, I'd kiss it! It was a bit expensive and I hesitated, but this company is very good to work with and the machine itself seems pretty darn solid. I bought mine through Amazon and held my breath when I bought it - but it has been worth - every single penny. Love it, and thanks again for sharing your review! Folding Proofer is Excellent Value! Glad you are liking your new proofer. I couldn't agree more with you, it is solidly built where it counts and performs way above my expectations. The proofer eliminates the issue of ambient conditions in a small area on the counter. I have been totally pleased with the way my breads, yogurt and recently, chocolate have turned out. Tempering chocolate requires precise temperature control to get the results you desire. In order of importance, I would have to say I think a proofing solution is higher in priority than a mixer. 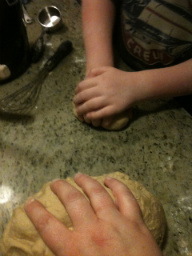 One can learn to combine and develop dough using your hands on any scale a home baker would use. But without an understanding of temperature control and the ability to provide that control, your results will vary wildly. The organisms are predictable if the environment is controlled. After years of hand kneading and bread baking, I rather value my KitchenAid and Electrolux. I am guessing you'd have to pry them out of my hands these days, but between the mixers, the proofer and my scale.. I'd have a hard time placing them in order of importance! Just adding to the positive comments, I love mine, and am getting much more consistent rises. Just as a new note.. I've had my proofer for nearly two full years now. I bake bread at least once a week, often times more. Its just a workhorse and has never failed me yet. I can't tell you how many times I've forgotten to switch it off, only to notice it when I put it away. Best product for bread baking, second only to a mixer. Love it! My 17 yo daughter's had a heck of a year--it's been an emotional rollercoaster since October, starting with getting a cancer diagnosis the same week she learned she had been accepted as a Rotary exchange student. Whew! Some wonderful things have happened as well to balance out the surgeries and the chemo. Included in that is being granted a Make-A-Wish shopping spree. She purchased some awesome items for herself. However, it's gratifying to know I raised a good kid--she bought gifts for everyone in the family. Part of her wish was making our wishes come true too. And what did mom get? The Brod and Taylor proofer! It's currently sitting on my kitchen counter, doing it's thing with a couple loaves of Hamelmann's Oatmeal Bread and waiting for that batch of his Ciabatta with Poolish so I can make rolls. We live in a drafty, chilly old house, so it will be loved all winter. Good to know I don't need to worry about covering the dough and that it will accommodate the KAM mixing bowl. And my daughter? She's in remission with a 95% chance for a cure. And she is in Sweden enjoying her student exchange. I love a happy ending! I came across your message while reading the review of Brod & Taylor proofer and the long thread of follow-up messages on the subject. I'd dearly like to get on but they don't sell to Europe and the UK dealer wants as much in sterling as it sells for in dollars, so I'm not holding my breath on that. I hope your daughter is making good progress and that her respite continues. Although my age means I'm no longer a member of Rotary, I still have a strong attachment to it and must say my years as a member were happy and fulfilling. We had 3 Exchange students from the USA who joined us at one of our lunchtime meetings, and it was clear they all felt they had benefited enormously from the programme. I'd have replied to your message before if I'd seen it but I chose to take an extended break from newsgroups, forums and almost all browsing as other things in life made more demanding calls on my time. I'm at the end of my self-imposed purdah and am looking forward to participating again here. Best wishes (and apologies to others for being off-topic if that offends anyone). Thank you for your good wishes, Sojourner. My daughter continues to enjoy a good remission, and had a wonderful exchange year in Sweden. We visited her for the last week of her exchange and stayed with her host family, which was a treat. I dried some of my starter so I could make a double batch of Pierre Nury's Light Rye for the family's Midsommer party. When it came time to make the final dough, I asked the host father if they had a mixer to knead the high-hydration dough. He nonchalantly pulled a DLX out of a cabinet and explained that the previous tenants had left it behind (why does this sort of thing never happen to me?). Once my husband and I regained our composure (you could have heard our jaws drop), I got to kneading and hubby logged into eBay. My gently used DLX was waiting on my porch by the time I returned home, a 25th wedding anniversary gift (as long as I keep my groom supplied with bread). Hubby, who is a mechanical engineer, and I are both so impressed with the engineering and design of the machine. It's a beautiful thing. And daughter is now stateside, attending college in Boston and requesting regular care packages of bread and cookies. I still love a story with a happy ending! I could learn to be green with envy! Until Windischgirl wrote about that DLX mixer, I lived in blissful ignorance. I'd never heard or read of such a thing. Now, after reading that message and googling DLX etc, I can see why someone would be willing to give one some house room. And, I have to confess, I never knew Electrolux made things as business-like as that. It looks like a serious piece of engineering kit. I have wondered a few times about going to the occasional auctions when catering gear is on offer but the images usually show such battered and bent bowls (plus there are only two of here, not a troop of soldiers) that I've never taken it beyond the wondering stage. Now I must go back through other threads I've missed during my absence and read up on Pierre Nury's light Rye. When I was making breads more regularly, I used to often add 10% rye to the mix. My next mission is going to be making Barley Bread a la Elizabeth David. She described it as being one of her favourite breads. Let's hope that has a happy ending too!